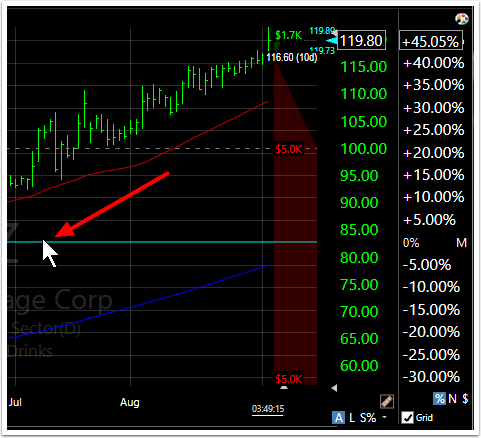 It is easy to measure specific price moves on the chart using the Ruler scaling tool. Whether in net, percent or dollar value calculations, quickly assess how much a stock has moved up or down from any given price value on the chart. At the bottom of the menu, click the small ruler icon. This opens a second scale on the chart. Clicking on the Ruler icon again will hide the Ruler scale. 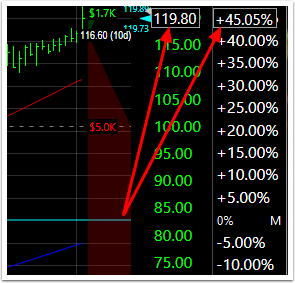 N = measures net move up or down from the cursor point on the chart. 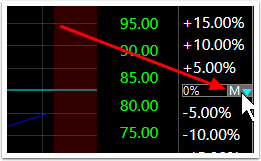 % = measures percentage move up or down from the cursor point on the chart. 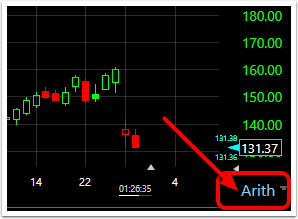 $100 = measures a dollar value move up or down from the cursor point on the chart (based on a $100 investment). 4. Select the basis on which the zero line will be set. 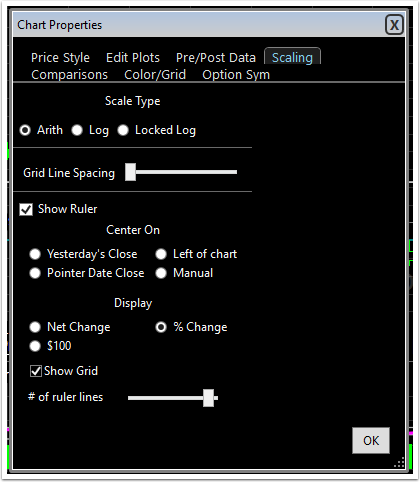 Click the letter next to the 0% value in the Ruler scale. 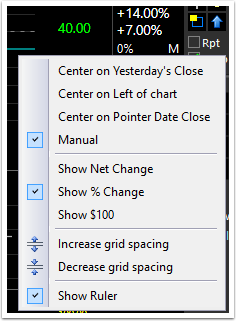 This menu also contains the selections for Net/Percent/Dollar value change. 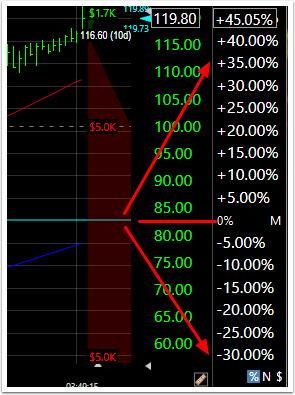 Click the mouse on the chart to place the blue line at that particular price level. This creates the "zero line" from which the moves up and down will be calculated. This measures the distance at any given point of the chart from the value represented by the blue zero line. 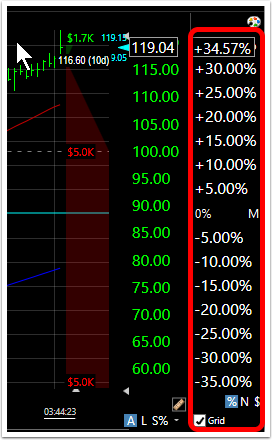 The move from the blue zero line to the current market price (close) is highlighted by a white box on the scale. 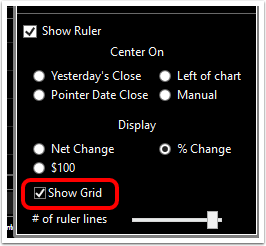 Check or uncheck the small Grid button to add the grid lines for the Ruler to the standard chart grid lines already in place. 7. 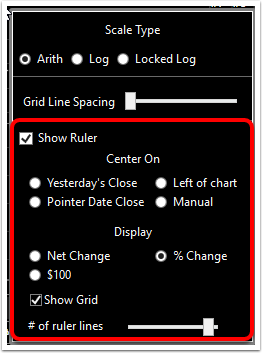 The chart right-click method to open the Ruler scale. 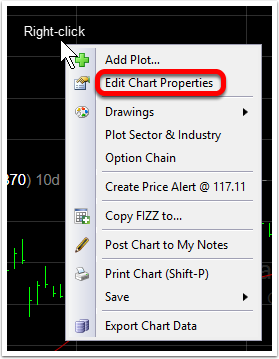 Right click on the chart and choose Edit Chart Properties to open the Edit window. 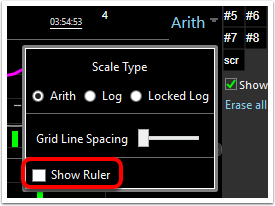 Place a check mark next to Show Ruler to open the Ruler Scale on the chart. Settings for the scale are now available in the menu.